30. 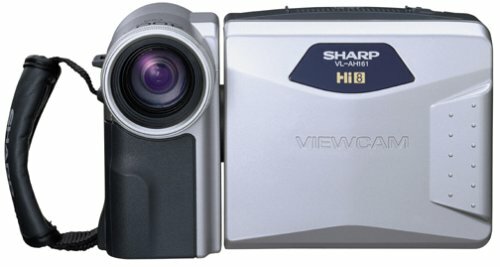 Sharp MiniDV Camcorder With 3"
Hi, I bought this camera to take it on a Millennium trip to Isreal, Egypt, Greece...and it did not disappoint. Amazing. I think I've replaced the battery only once. IT comes with a charger so make sure you get that too. Easy to use. Be careful when loading the tape so you down force it. Never had problems with it but it looks pretty delicate when you see the fancy mechanism. Great almost 3 inch playback. Great zoom. Now all I have to do is edit all of these tapes. Saw that it isn't the best for Apple's MOVIE program but I'm going to use directions on HOW THINGS WORK -- for editing Mini-DV -- wish me luck. Swivel makes it easy to shoot vertical or horizontal. Easy to give to a pal to use. Like that you can get 90 minutes on one tape. Be careful, I recently somehow taped over a vaulable tape so pull that little green tab on your digital video tapes so you can't re-record accidentally. SO MUCH FUN -- makes even an event you DON"T WANT TO GO TO -- ie some party or wedding or something a lot of fun. Because the results are so good and the SOUND IS AMAZING. REALLY AMAZING SOUND for mini-dv -- plus you can put it in a tote bag or a large purse if you're a lady. No need for big camera bag. The stabilization tech eliminates need for tripods etc and it seems to work just as well inside a room at night vs during the day.....worth every penny -- and if you can get one used--well-- do it today!! js. small enough to take everywhere.....it's been all over the world and through some tough climatesand still works great! 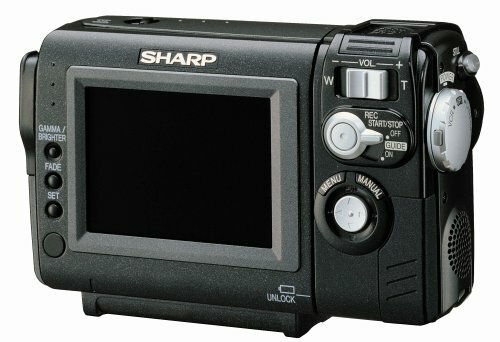 Large LCD for viewing eliminates the need for a view finder, which most people don't use with todays DV camera. Functions easy to access. Takes 37mm filters. Suggest purchase of two batteries so you can cut back on down time when shooting. Liked it so much....getting one for my son in the military!! Looking for underwater case...if available. I received this camcorder for Christmas. I have always had a noise coming from the inside of the camcorder. In the beginning the noise wasn't that noticeable.But over time the noise had gotten louder. I used the recommended cleaning tapes, but didn't seem to work. According to the manual, there's the possibility of the video head being worn. The repair will cost to much to fix. I have a friend with the same camcorder, and hers is broke also. The only difference between the two, is mine will still record, but the noise is louder, and hers won't record at all. There are a lot better choices than this camcorder. Hello.....i think thas its a good videocam...but i would like to know...where can i buy a charger for this model?..I am living in Tampa...but..I couldnt find it...please...help me. We got this camera a few months ago and never used until we finally had some special occassions to record. We were able to record two and on my daughter's 8th birthday party it came up with the DEW error and we tried very hard to get it back to normal. We left the cassette door open for days and no change. Do not buy this camera, it will take away from your special occassion when you least expect it. This electronic device is not worthy. I gave it one starbecause there isn't a lower rating. 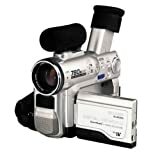 this camcorder is pure garbage, i purchased brand new from circuit city , only used it 4 or 5 times also , i now get the dew message, i tried everything from putting it into bags , airing it outside in dry weather, using blow dryer, using little sacks of silicia then placing the camcorder in a bag to dry it out, nothing works !!!!! 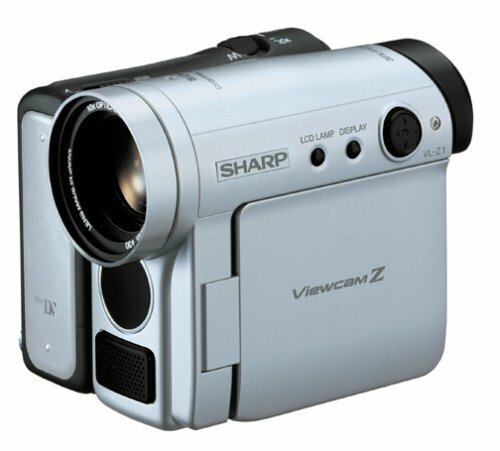 I bought this camcorder one month ago just for my holiday tour.This is a nice item considering its price.The image is sharp.The voice recorder is really nice.It can record even some remote voices. Easy to use. 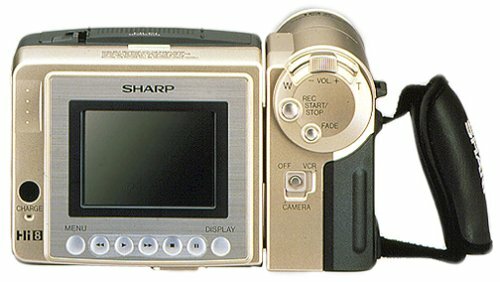 I bought this product because it was cheapes, but then I saw another MiniDV camera from Canon (ZR60) which was only slightly costlier than this camera but had far more features and made this camera look completely inadequate. I bought my camera 2 month ago and i am deligthted. I bought this camera after seeing the reviews on amazon.com, in particular that it was durable. I enjoyed doing videos with it. But very soon after the warranty expired, the video stopped working. It still worked as a VCR, but not as a camera. 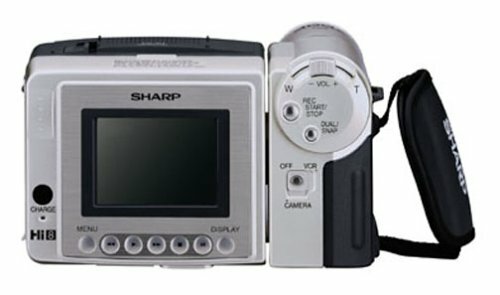 When I sent it for repair at one of the Sharp partners, the bill to repair would have been higher than the cost of the camera!!! 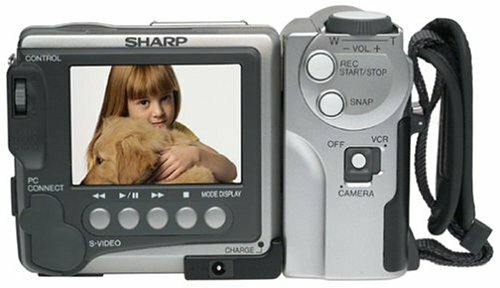 So be aware that this is not in fact a durable camera, and Sharp USA did nothing to help the confidence of this ex-customer. I was extremely pleased with this camera when I first got it.It was a great bargain and I got a rebate, too!The features on it were amazing for the price and the video was quality was every bit as good as I expected, if not better.Then, after about a year of being exceedingly pleased with my purchase, my favorite toy started eating tapes.I get the famous EJECT CASSETTE message nearly every time I attempt to rewind now.About half of those times, the machine ends up messing up a part of the tape by getting it stuck in the mechanism.Then I have to carefully extract it myself and rewind manually.Even doing this causes some wear and tear on the tapes now because they just weren't made for winding and unwinding by hand and they sometimes end up getting stretched out a little too far in the process.If you've got the expendable cash and just need a full-featured camera to last you a little while, go for a Sharp.If you need something durable and want some actual bang for your buck, pay more for another brand.I'm waiting for the days when camcorders record onto hard drives...In the meantime, my next camcorder purchase for personal use will likely be a DVD-RAM model.Forget about tapes.But most of all, forget about Sharp. All of the negative reviews of this product are true. It eats tapes, or makes them unusable at a certain point. I, too, was under warranty when this started to happen (after the first tape!). I had to send to to NY, and had to pay for the labor, which was half the price of the camera. When it finally came back, it did the same thing. I don't even know where to go with the lemon laws for this one. I liked the size and the quality of pictures. The digital pictures were good also. The problem is getting the pictures to play back. Seems the clogged head syndrome appeared. The picture was distorted and now after 1 month, I have to return the camera for repairs. For the cost of this camera, one would expect to use it more than once every month. I think the price of this camera should reflect that of one that has a manufacturers rebuild. Recent research shows we will be waiting for parts to get it fixed. This one, and others break.They break without warning, and you are out 500 to 800 dollars. I have this projector in my home theater and think that for the money it is one of the better buys out there.I compared it to the Infocus 7200 and decided that the features of the Sharp gave me more flexibility. 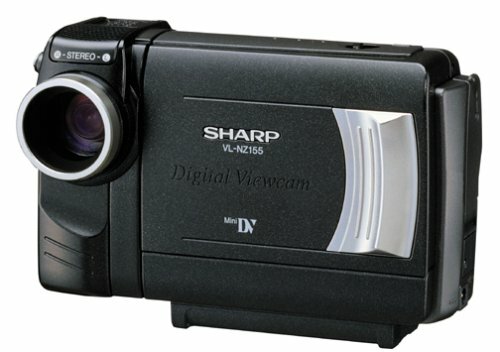 I wanted a reliable, simple to use, high quality camcorder at a good price and the Sharp VLAH150 so far has met all my criteria.You can't go wrong buying this camcorder. Two words to describe ease of use--Point and Shoot !!! My wife and I looked at many camcorders and she instantly liked this one.I asked her why and she said the design(non-flip 3" screen) and the main reason was that there wasn't a million buttons all over it.Buttons scare the average person.Once we started using it she told me thats why she would not use our old one.This model is very simple and gives new meaning to 'point and shoot'.Personally I like lots of features and boy, does this camera have features!Letterbox recording, black and white, sepia, strobe, photo shot, pic-in-pic, awesome zoom. All this and lots more! !You can't beat it for the price (...). My relatively new camera suddenly shut off (with lens still extended) while I was shooting, and won't turn back on even with new batteries or adapter.Still covered under parts warranty (but not labor).The service center said this is a fairly common problem with this camera.I have to pay like $30 to have shipped back and forth from service center and fixed under an additional $80 flat rate--over $100 to fix! I bought this camera back a few months ago. Ididn't want to spend a lot so I took a chance on SHARP. I'm glad I did! Friends spent twice the $$$ on so called top of the line cameras. 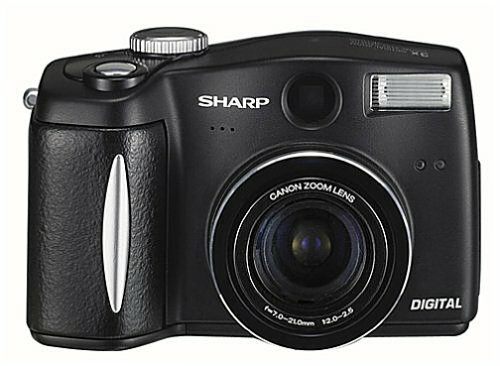 This SHARP camera takes great photos and looks like it will hold up mechanically as good as anything I've seen. You will be pleased if you buy. Best Dam Digital for the price! for this price, i would recommend buying a Sony Hi8. Ah, the Sharp Hi-8.You'll feel like Hitchcock, with the weight of Truffuat.It's the everyman's dream for spontaneous and painless camcording.Light and convienient, durable and stellar for eveningrecording.It's all you'll ever need. Response to the Con's of not having a light. 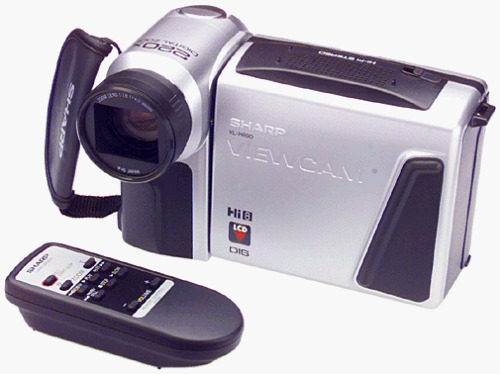 A great camcorder for a starter!!!!!! After a lot of questions and reading I decided to go ahead and buy this camcorder. Before getting it I was worried about how complicated it would be to operate since I have never used one. Boy was I worried over nothing!!! The moment I opened the package the only thing to do was charge the battery and start enjoying. A great product, extremely easy to use and very easy to connect to a TV. As soon as the tape finishes I`ll try and record the Hi8 to my VHS for storage. VERY PLEASED!!!!!!!!! 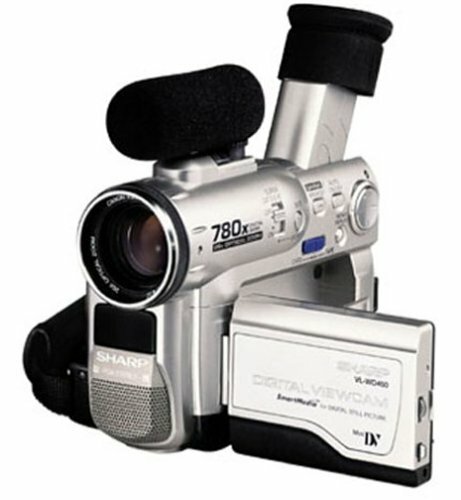 I bought this as my first camcorder a year ago, it is fun and easy to use. With in the first hour I was filming happily with great results. Just hook it up to the TV to watch on big screen and it's easy to record onto a VCR. Although adding sound on it is a little harder. The main problem I expierenced was holding steady at 16xzoom...but it works fine if I hold it against something, a railing or table top etc...Also the LCD screen is not protected and I was worried I'd damage it at first, but a year later and its still working fine after many hours hiking in the woods and riding in the skiff, so I guess it's a pretty hardy viewing screen. Also I bought a 3 hour battery, the batteries need to be completely drained to re-charge and that is a drag but...it's still wonderful and I am very happy with it! 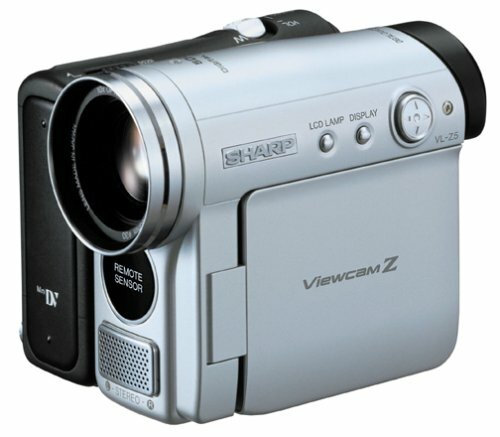 A great camcorder for the money. 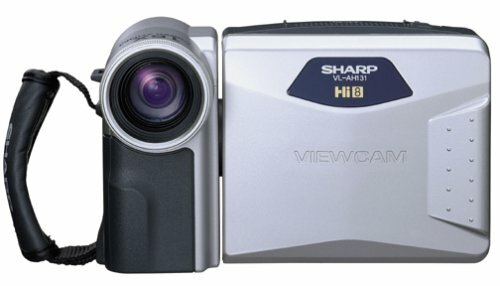 This is the Best Camcorder I have ever owned! Digital picture effects allows you to select from six different effects to record the subject with a more dramatic effect. I'm pleased with the camcorder so far.For the price, it has some nice features.The 3.5" LCD is nice and provides an excellent picture.The camera is easy to use and the menus are fairly intuitive.The one complaint I have so far is that there is not a dedicated button/switch for the digital image stabilization.You must navigate through the on-screen menus to find the DIS and toggle it on/off.This is inconvenient and cumbersome while recording.So much so that I think I'll probably never use it.But for what I plan to use the camera for, it works great and is a very good value. This is a great camcorder light, compact and useful. The zoom function and pip are definite attractions. PROS - 1. This is a good buy in this price range.